1- How does the adoption process work? The first step is to fill out your application online. Then arrangements will be made for your in-home interview and once that is complete, you will be set up to do your fantastic online training. Once completed and if a suitable match is available we will set up a time for you to pick up of you new family member. At that time you will have the opportunity to sit down with Deb (Dog Trainer and Canine Consultant) for an hour+ and have all your questions answered and she will go over some things with you to even better prepare you. If a match is not currently available (which doest happen very often), your name will go on our list and the wait is never too long. We bring up dogs very regularly, usually every month or two. 2- Are these dogs good with kids? Greyhounds do not understand the meaning of a child rushing, crawling, reaching over his head, running up to it or trying to kiss or hug it, especially when it is laying down (even if it is awake!). A dog may choose to get up and walk away, do nothing, growl or it may even snap or bite. Even a child sitting quietly next to a greyhound who is laying down, may make the greyhound very uncomfortable. Children must be well behaved around the dog and follow the rules for Greyhounds and children. Parents must never leave a child unattended with the dog. We provide child safety training but before the age of 5 it is nearly impossible for children to grasp the rules and to follow them all the time. Its not just about the child not "hurting" the Greyhound, but the dog can react out of fear or stress over everyday occurrences as mentioned above. Its also not about the child being "used" to dogs either - that can actually make it more difficult as the child will be too familiar with the dog and the Greyhound may not be used to or ready for this. If a baby were to come along into the family later, that is a completely other matter. 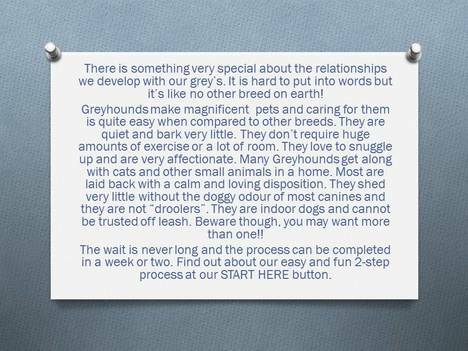 We can actually help you with preparing the Grey for the baby and introducing the baby to the dog and how to make this transition easier for you and your Grey. Older children make awesome companions for Greyhounds! QUOTE: "I know how important it is to teach children safety around adult dogs. We very much appreciated the visit of not one but two persons to discuss the matter before receiving our Grey and we realized after that, it was not exaggerated. Also we now often discuss with friends the importance of teaching children about dog safety and tell them how good the training you gave us and the kids was. I fully understand now why you do not give dogs to children under 5 and the success of Ripousse adoption is certainly strongly related to the training you provided us". Monique. 3- What does the adoption fee include? Our adoption fee includes the online training course which on its on is a 175.00 value. It also includes the following: a martingale collar and leash, a beautiful beaded ID collar, an ID tag, and a muzzle. We have the dogs themselves spayed or neutered, vaccines are up to date, their first Sentinel or Revolution is given, the first de-worming is done and an ear cleaning is done, they have a bath, nail trim, and most often dentals are even done as well as transportation is included from the States into Moncton NB. Our fee does not even come close to covering all of our costs incurred. We fundraise and work hard to make up the difference so we can adopt them out at this very low rate. MGAP pays for their neuters and spays and all medical costs required prior to adoption. The dogs are never neutered while still racing. 4- Where do the dogs come from? All the dogs are brought up from the US, as pari-mutuel betting on dog races is illegal in Canada. Most of MGAP's greyhounds come from Florida. 5- Should I adopt the greyhound during my vacation time or a Christmas break in order to spend quality time and help him get adjusted? Actually no, that may not be the best idea. By spending the first few days solely with your dog and and having visitors, neighbors cooing and fussing over him, then off to work/school you go - it makes it a set up for separation distress. Just imagine from the dogs point of view, it was great when everyone was around and suddenly it is SO quiet and lonely. Getting the dog on the weekend and slowly building up alone time [starting right away] is easier on your dog. a couple afternoon or mornings off the first week would be helpful though. This way he will be become accustom to being alone gradually and not feel abandon. Keep his first few days in his new home, low key for him with lots of short planned departures and very few visitors. Remember, at the track they were used to lots of crate time, if you keep that up at the start it goes more smoothly. The crate should only be needed for a couple of months. We teach this in detail at our training session. 6- How long do I have to wait? The process can take a week to a few weeks. Its best to submit your application if you are looking to adopt within a few weeks. If you submit your application too early, your information may not be current by the time you are ready and you may have to re-submit. 7- Are Greyhounds good with cats or other small dog breeds? Most are but not all Greyhounds are good with cats and small breeds, just like any other breed of dog. More than 90% of MGAP'S Greyhounds are placed in homes with cats and/or small dog breeds. A loose cat or squirrel running in your fenced in yard may be another story as they may not see the cat indoors the same way as when they are running loose outdoors. Set them up for success by never allowing this to happen. 8- Do Females make better pets than males? Not at all. Each dog is an individual. It really is a personal preference. Many families have greyhounds of both gender and see no difference with regard to personality, tolerance, affection and gentleness. However, males are usually less dominant and more laid back than females. We "generally" like to place the males with the young children - but we have placed both successfully as its mostly an individual temperament issue. The females can tend to be more energetic, but for a Greyhound, that is not saying much! The males are usually larger in size although we have brought up an 80lb female and a 62lb male, but don't let a few lbs sway you either way, the personality is the most important factor and our matching and fostering program will help you with this greatly. This is a big advantage of adopting through MGAP. You can read testimonials on this on our available dog page. 9- Are there many inherited health issues with the Greyhound? No, not many due to excellent breeding practices. The breed is very healthy and sound and can live to be 12 years or more. We have heard of a few Retired Greyhounds living to be 18 years old. 10- Do Greyhounds need to run regularly? Or need a lot of exercise? No more than any other large breed. They enjoy a nice 20-30 minute walk each day to stretch their legs and take in the mental stimulation of the sights and smells, but they do not have to run. They are mostly sprinters, not endurance dogs and will tire out quickly. They do enjoy their "outings" though but they may need to build up to distances in the beginning And again, each dog is different, some need more exercise than others. Some can do and really enjoy long hikes but all dogs need exercise and most importantly they need mental stimulation -simple nose work is great. Our course "Enriching your Dogs Lives" will teach you all about this. You can access this now free of charge on our MGAP YouTube channel. 11- Can I train my Greyhound to go “off” lead? No, never! They have an "instinct" to chase, and when they see something they want, they will go for it and no training can stop them. It’s like when the starting gates opens, they're off and remember, they can get to 45mph in less than 3 seconds. They tune you out and have no street smarts at all. They are safe and very happy on the lead with their people. Some enjoy their runs in a fenced in area -some prefer to lounge around. And remember, most cities have by-laws restricting any dogs from being off lead anyway. These laws are for EVERYONE!!! 12- Can I tie my Greyhound outside? No, again if they see something to chase, they will sprint to the end of the rope and break their neck. They reach top speeds in under three seconds - basically three strides. All dogs shed, but Greyhounds have very short hair and shed very little. You mostly notice it twice a year with the change of seasons or while under stress. Brushing and a fish oil or Omega capsule each day with give them a healthy, shiny coat. A sardine packed in water in their stuffed kong would also be very healthy for them. Most, but not all, people with allergies are not allergic to Greyhounds. Also, they do not have the oil in their skin that causes the wet dog smell. They are considered hypo-allergenic (which means a lower occurrence of allergies) but there are no guarantees of course, each person is different. 15- Do Greyhounds make good watchdogs? No, most rarely bark and are not normally overly territorial. But just owning a dog is usually enough to deter people from seeing your home as an easy target. Not usually, Greyhounds are an indoor type dog and want to be near you. But leaving a bored greyhound outside in a fenced yard by himself, he may have to make his own entertainment. Digging pits are a great idea for enrichment of your dog. 17- Are Greyhounds Intelligent? And can you teach them Obedience training? Yes, highly intelligent and very fun to train! They learn very quickly and are eager to please. They can do amazingly well in obedience classes and can learn lots to tricks too. Most are calm and food motivated so its really fun to train them. Contrary to the "myth" ALL Grey's can be taught to sit. 18- What if I can no longer keep the dog? We will take the dogs back and ensure it is re-homed into a loving home. But remember, we are looking for a life long commitment, its very hard on dogs to be re-homed and that will be one less dog we can bring up. If you are not ready to commit 100% to making the adoption work, please do not adopt! Leave the dog for someone else who will. 19- How old are the Greyhound racers when they are retired? On average, anywhere from 1 1/2 - 5 years of age, however 2 - 3 is the average age but we bring up some older dogs too - brood mom's and studs need homes after they retire too & some people love providing a home to a senior dog who really needs one. They are very laid back and settled at that point too. 20- How much does it cost to feed a Greyhound? If feeding a good quality dry kibble, a Greyhound eats an average of 4 cups a day which is about $1.20 per day. More information is given on how to shop for food and feeding during the adoption process. 21- How big are Greyhounds? Males are 26 - 30" at the shoulder and weigh between 60-85 lbs. Females are 23 - 26" at the shoulder and weigh between 50 - 75 lbs. Remember, smaller size does not mean an easier dog. The small females can be little spit fires with high energy and a big boy can be a lazy, laid back cuddle bug. 22- Do I need a Crate? Yes, a crate is very important for the first few weeks. The Greyhounds are used to the crate and it will make them feel safe and secure. It helps them adjust to their new home safely and it is very useful when training your new Greyhound. We recommend the wire crates as they are not as confining as the plastic ones and give more visual stimulation as well as ventilation. But on the other hand, we don't like to see the crate used permanently as any dog deserves the freedom of a home. It is a tool and if used properly, a wonderful one, but it can be abused as well. We explain the proper use of the crate in the training course. 23- Are the dogs house broken? The Greyhounds have never been in a house before, however they are kennel trained, which means that they are used to going outside to relieve themselves. For this reason, the transition from the crate to the house is quite easy for them. You are taught all about this during the training course. Our fostering program also gets these dogs off to a great start for you. 24- Why do Greyhound need a special type of collar? The Greyhound's head is smaller than their neck which improves their peripheral vision, however a regular collar would slip right off. The martingale collar will tighten when pressure is applied however, it will not hurt their delicate neck if adjusted properly. Its important to have them adjusted behind the ears so they can't slip over and back out of them, this also helps protects their neck and spine. We have these special collars available and are good quality with welded steel. 25- Do Greyhounds do well in our cold winters? Yes, they do very well. They love to play in the snow just like kids do. They do however need a warm coat to wear in the colder months. We have these available to purchase as well. Some owners like to put boots on them in the winter as well, this is a personal choice based on your needs. 1-Comment fonctionne la procédure d’adoption? La première étape est de remplir le formulaire en ligne. Par la suite, nous irons à votre domicile pour une entrevue. Une entrevue finale qui comprend une session de formation fantastique sera nécessaire. Si vous êtes un bon candidat pour un lévrier, votre nom sera placé sur notre liste d’attente pour le prochain groupe de chiens disponibles ou, s’il y a une compatibilité adéquate à ce moment, vous pourrez planifier l’accueil de votre nouveau chien tout de suite. Puisque PALM reçoit les chiens tout au long de l’année, l’attente est généralement assez courte. Le meilleur moment – rencontrer le nouveau membre de la famille! 2-Ces chiens sont-ils bons pour les enfants? PALM recommande 5 ans ou plus, tels que font la plupart des groupes consciencieux, puisque nous souhaitons ce qu’il y a de mieux pour vous et votre lévrier! Les lévriers ex-coureurs n’ont pas beaucoup de socialisation précoce et n’ont pas eu l’occasion de socialiser précédemment avec les enfants. De plus, ils sont de grands chiens matures qui ont tendance à être sensible de nature, ce que les jeunes enfants ne comprennent pas. Les lévriers ne comprennent pas lorsqu’un enfant s’approche rapidement d’eux, ni lorsqu’il rampe, tend les mains au dessus de leur tête ou court vers eux pour leur donner un baiser ou une caresse (spécialement lorsqu’ils sont allongés). Un chien peut choisir de simplement se lever et de s’éloigner, mais il peut également choisir de grogner, de donner un avertissement ou de même mordre. Les réactions mentionnées peuvent même se manifester si un enfant s’assoit silencieusement près du lévrier qui est allongé et bien éveillé, juste parce que le chien peut se sentir mal à l’aise. Afin d’avoir du succès, les enfants doivent avoir une bonne conduite, c’est-à-dire qu’ils doivent être capable de suivre tous les règlements enseignés lors de la formation au sujet des lévriers et des enfants. Les parents ne doivent jamais laisser leurs enfants seuls avec le chien. Notre organisme offre une formation sur la sécurité des enfants. Par contre, avant l’âge de 5 ans, il est presque impossible aux enfants de comprendre les règlements et de les appliquer adéquatement. Les précautions que nous valorisons ne sont pas seulement pour éviter que les enfants « blessent » le lévrier, mais puisqu’un chien peut réagir selon la peur et le stress des occurrences journalières telles que mentionnées ci-haut. Il ne s’agit pas non plus à l’enfant d’être «habitué » au chien – cela peut rendre les choses encore plus compliquées si l’enfant se sent trop familier au chien et que le lévrier n’est pas encore habitué ou prêt à cela. S’il y a un nouveau bébé naissant parmi la famille plus tard, c’est toute une autre histoire. Nous pouvons actuellement vous aider à préparer le lévrier pour l’arrivée du bébé, à lui présenter le bébé et vous aider à faciliter la transition pour vous et votre lévrier. Les enfants plus âgés font de très bons compagnons pour les lévriers! CITATION : « Je suis consciente de l’importance d’enseigner la sécurité aux enfants lorsqu’ils sont en compagnie de chiens adultes. Nous avons grandement appréciés la visite, non pas d’une, mais de deux personnes pour discuter le sujet avant de recevoir notre lévrier et nous avons réalisés par la suite, qu’il n’y avait aucune exagération. Nous discutons fréquemment avec les amis l’importance d’enseigner aux enfants la sécurité envers les chiens et de leurs laisser savoir comment la formation que vous nous avez offerte à nous et à nos enfants fut adéquate. Je comprends pleinement l’importance la raison pour laquelle vous n’offrez pas de chiens aux enfants de moins de 5 ans et le succès d’adoption de Ripousse est certainement fortement relié à la formation que vous nous avez offerte. » Monique. 3-Combien l’adoption coûte-t-elle? Et que comprend t-elle? Les frais de l’adoption sont de 295.00$ -SELON NOTRE CONNAISSANCE ACTUELLE, LE TAUX LE PLUS BAS AU CANADA-(les lévriers entraînés en prison coûtent un peu plus de 325.00$) et les frais initiaux comprennent une session de formation de 3 heures avec un thérapeute de conduite certifié, le soutien amical PROFESSIONNEL gratuit à tout moment, une trousse d’adoption ainsi qu’un formidable « manuel d’instruction », un nouveau collier Martingale, une nouvelle laisse, une étiquette d’identification, une muselière et la transportation des États-Unis vers Moncton au NB. Les chiens eux-mêmes, sont stérilisés ou castrés, vaccinés, examinés pour le filaire des chiens (heartworm), ainsi qu’un examen de tiques, traitements pour les vers et les parasites, leurs premières sentinelles, et souvent, même les soins dentaires sont donnés. Nos frais couvrent très peu les coûts requis. Nous faisons des collectes de fonds et nous travaillons fort pour couvrir la différence afin de pouvoir adopter les chiens à ce taux très bas. 4- D’où viennent les chiens? Tous les chiens viennent des États-Unis, puisque le pari mutuel des races de chiens est illégal au Canada. 5- Devrais-je adopter un lévrier pendant mes vacances ou pendant le congé de Noël afin de passer du temps de qualité avec lui et lui donner le temps de s’ajuster? En effet, non, ce n’est pas la meilleure idée. En passant quelques jours entièrement avec votre chien et en ayant des visiteurs et des voisins qui l’admirent constamment, votre lévrier va penser que cela est la norme. Par contre, quand vous partez pour le travail/l’école, le chien pourrait développer des signes de détresse en raison de la séparation. Imaginez le point de vue du chien : c’était formidable lorsque tout le monde était présent et soudainement, c’est tellement silencieux et ennuyant. Nous remarquons qu’aller chercher votre nouveau chien pendant les fins de semaines est plus bénéfique afin de commencer graduellement à l’habituer à être solitaire [dès le départ]. Cette méthode est plus facile sur votre chien. Nous recommandons quand même des petits congés, si possible, une ou deux après-midi, ou quelques matinées pendant la première semaine. De cette façon, il deviendra graduellement habitué à être seul sans se sentir abandonné. Pendant les premières journées dans son nouveau foyer, gardez le tout très simple, nous recommandons que vous planifiiez des départs courts et fréquents, et très peu de visiteurs. Il faut se rappeler que sur le terrain de course, le lévrier était habitué à passer beaucoup de temps en caisse. Si vous maintenez cette habitude au début, la transition sera plus graduelle. La caisse devrait seulement être requise pour environ deux mois. Nous vous enseignons ces détails à la formation.6- Comment longtemps dois-je attendre? Le procédé peut prendre d’une à plusieurs semaines. On vous suggère de soumettre votre application si vous avez l’intention d’adopter d’ici quelques semaines à deux mois. Si vous soumettez votre application trop tôt, il est probable que votre information ne soit plus récente lorsque vous serez prêt. 7- Les lévriers sont-ils bons avec les chats ou autres races de chiens? La plupart sont bienveillants mais pas tous les lévriers sont bons avec les chats ou autres races de chiens, tout comme toutes les autres races de chiens. Environ 90% des lévriers du PALM sont placés dans des foyers qui ont des chats ou autres races de petits chiens. Par contre, un chat ou un écureuil errant se promenant à l’intérieur de votre clôture isolée peut être une autre histoire. 8- Les femelles sont-elles de meilleur animaux domestiques? Pas du tout. Chaque chien est un individu. Il s’agit vraiment d’une préférence personnelle. Plusieurs familles ont des lévriers des deux genres et ne distinguent aucune différence en ce qui concerne la personnalité, la tolérance, l’affection et la gentillesse. Cependant, les mâles sont moins dominants et plus calmes que les femelles. Nous aimons « généralement » placer les mâles avec les jeunes enfants – mais avons placé les deux genres avec succès. Les femelles ont tendance à être plus énergétiques, mais pour les lévriers, ça ne veux pas dire grand chose! Les mâles sont généralement plus lourds malgré que nous avons déjà reçu une femelle avec une masse de 82 lbs et un mâle de 62 lbs. Ne laissez pas le poids des chiens influencer votre décision, la personnalité est sans doute le facteur le plus important. 9- Y a-t-il beaucoup de facteurs de santé génétique chez les lévriers? Non, pas beaucoup en raison de l’excellente pratique en matière d’élevage. La race est saine, en très bonne santé et peut vivre au-delà de 12 ans. Nous avons entendu parler de quelques lévriers qui ont vécu jusqu’à 18 ans. 10- Les lévriers doivent-ils courir régulièrement? Ou requièrent-ils beaucoup d’exercices? Non, pas plus que toutes autres grandes races de chiens. Ils apprécient une bonne marche de 20-30 minutes chaque jour pour étirer leurs jambes, mais ils n’ont pas besoin de courir. Ils sont vraiment des sprinteurs, pas des chiens d’endurance puisqu’ils se fatiguent rapidement. Ils apprécient vraiment leurs « sorties » mais auront possiblement besoin de s’adapter à la distance. Et encore, chaque chien est différent, certains requièrent plus d’exercice que d’autres. 11- Puis-je entraîner mon lévrier de marcher aux pieds sans laisse? Non, jamais! Ils ont l’instinct de chasser, et lorsqu’ils voient quelque chose qu’ils aimeraient avoir, ils vont y aller et aucune formation ne peut les arrêter. C’est tout comme les clôtures qui s’ouvrent aux courses, ils sont partis très rapidement et ils peuvent atteindre 45 mph en moins de 3 secondes. Ils vous ignorent et n’ont aucun sens de la rue du tout. Ils sont en sécurité et ils sont très heureux au milieu de leur peuple. Certains lévriers apprécient courir à l’intérieur d’une clôture isolée – d’autres préfèrent s’allonger. Et, souvenez-vous, la plupart des villes ou municipalités ont des lois qui ne permettent à aucun chien de s’éloigner sans la laisse. Ces lois s’appliquent à TOUT LE MONDE !!! 12- Puis-je attacher mon lévrier dehors? Non, encore une fois, s’ils voient quelque chose à poursuivre, ils partiront et il y a de forte chance qu’ils se casseront le cou. Ils atteignent une vitesse maximale en 3 secondes – fondamentalement en 3 bonds. 13- Les lévriers perdent-ils leur poils? Tous les chiens perdent leurs poils, mais les lévriers ont un poil très court qu’ils perdent très peu. Vous allez remarquer la perte de poils surtout deux fois par année pendant le changement des saisons ou pendant des situations de stress. En les brossant et en leur faisant consommer une capsule d’huile de poisson ou d’oméga chaque jour, leur manteau sera en santé et sera éclatant. 14- Les lévriers sont-ils hypo-allergénique? La plupart des personnes qui ont des allergies ne sont pas allergiques aux lévriers. De plus, leur peau ne possède pas l’huile causant l’odeur de chien mouillé. Ils sont considérés comme étant hypoallergénique (Ce qui veux dire que l’occurrence d’allergies est moins élevée), mais il n’y a aucune garantie, naturellement, chaque personne est différente. .
15- Les lévriers font-ils des bons chiens de garde? Non, la plupart jappent rarement et ne sont pas généralement des chiens qui protègent. Généralement, appartenir un chien peut décourager les gens d’observer votre foyer comme une cible facile. Pas habituellement, les lévriers sont des chiens de type intérieur et veulent être prêt de vous. Mais en laissant un lévrier dans l’ennui à l’extérieur dans une clôture isolée, il pourrait créer son propre divertissement. 17- Les lévriers sont-ils intelligents? Et pouvez-vous leur enseigner l’obédience? Oui, les lévriers sont très intelligents. Il peut être très amusant à entraîner ce type de chien! Ils apprennent très rapidement et désirent plaire. Ils peuvent faire incroyablement bien dans un cour de dressage et peuvent apprendre beaucoup de trucs et astuces. Ils sont calmes et motivés par la nourriture. Contrairement au « mythe », TOUS les lévriers peuvent apprendre comment s’asseoir. 18- Qu’arrive-t-il si je ne peux plus garder le chien? Nous prendrons les chiens de nouveau et nous nous assurerons qu’ils soient placés dans un foyer affectueux. Mais souvenez-vous, nous cherchons pour un engagement à vie, il est très difficile de replacé un chien dans un nouveau foyer. De plus, il faut considérer que cela signifie qu’un chien de moins sera sauvé par notre organisme. 19- Quel âge ont les lévriers de course lorsqu’ils sont retraités? En moyenne, ils sont habituellement entre les âges d’un an et demi et de 5 ans, cependant, 2 à 3 ans, est l’âge moyen, mais nous recevons aussi des chiens plus âgés sur demande – les mamans de couvées et les mâles ont aussi besoins de foyers lorsqu’ils sont retraités et certaines personnes aiment offrir un foyer aux chiens plus âgés qui en ont vraiment besoins. Ils sont également très calmes et ajustés à ce moment-là. 20- Quel est le coût pour nourrir un lévriers? Si vous nourrissez votre chien avec de la nourriture à sec de bonne qualité, un lévrier mange environ 4 tasses par jour et cela coûte environ 1.20$ par jour. Plus d’information est donnée sur la nourriture et l’alimentation pendant la session de formation. 21- Quel est le coût pour nourrir un lévrier? Les mâles sont de 26 à 30" à l’épaule et pèsent entre 60-85 lbs. Les femelles sont de 23 à 26" à l’épaule et pèsent entre 50 et 75 lbs. 22- Ai-je besoin d’une caisse? Oui, une caisse est très importante pour les premières semaines. Les lévriers sont habitués aux caisses et ils se sentiront plus sûres. Cette stratégie permet aux chiens de s’ajuster à leur nouveau foyer en toute sécurité et la caisse est très utile lorsque vous entraînez votre nouveau lévrier. Nous recommandons les caisses à grilles car elles ne sont pas si enfermées que celles en plastique et elles offrent plus de stimulations visuelles ainsi que plus de ventilation. Mais d’autre part, nous n’aimons pas son utilisation à long terme puisque le chien mérite d’avoir la liberté dans son nouveau foyer. C’est un excellent outil lorsqu’il est utilisé adéquatement, mais on peut en abuser également. On vous explique le tout à la session de formation. 23- Les chiens sont-ils adaptés au foyer? Les lévriers n’ont jamais été dans une maison auparavant, cependant ils sont adaptés à la niche, qui veut dire qu’ils sont habitués à aller dehors pour faire leurs besoins. Pour cette raison, la transition de la caisse au foyer est assez facile pour eux. On vous explique tout à la session de formation. 24- Pourquoi les lévriers ont-ils besoin de colliers spéciaux? La tête du lévrier est plus petite que son cou qui améliore leur vision périphérique, cependant un collier régulier glisserait et tomberait. Le collier de martingale resserrera quand la pression est appliquée, cependant, ne blessera pas leur cou s’il est ajusté adéquatement. Il est important de l’ajuster derrière leurs oreilles afin qu’on puisse le glisser et le retirer, et, il protège également leur cou et leur colonne vertébrale. Nous avons ces colliers spéciaux qui sont disponibles et ils sont de bonne qualité avec de l’acier soudé. 25- Les lévriers s’adaptent-ils bien à nos froids d’hiver? Oui, ils s’adaptent très bien. Ils aiment jouer dans la neige de la même façon que les enfants. Ils requièrent cependant un manteau chaud qu’ils peuvent porter pendant les mois les plus froids. Leur achat est également disponible. Certains propriétaires aiment les chausser de bottes pendant l’hiver également, c’est un choix personnel selon vos besoins.